I love making bread. I have been making our family’s bread for just about as long as I can remember. As a result, it is very easy for me and I can whip up a few loaves at a moment’s notice. (Okay, I actually need about 3 hours notice, but you know what I mean). Homemade bread is so wonderful that when you bring a loaf to someone, they act as if you have just mastered French pastry-making! One time, I can remember, we were having a backyard barbecue for a few friends. It was raspberry season and I had gone the day before to pick raspberries with my sister. I slaved over the making of two wonderful raspberry/peach pies. 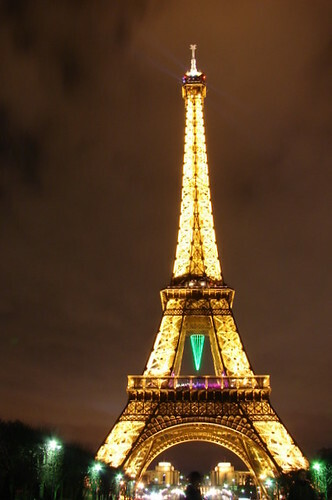 I poured my heart into them, even making woven lattice for the top. I couldn’t wait to offer them to my guests. A few hours before they were to arrive, I got concerned that we might not have enough food, so I decided to whip up a few loaves of bread. Absent-mindedly, I tossed the loaves together and baked them. When dinnertime arrived, the comments rolled forth about my bread. “Oh, this is the best bread I’ve ever tasted.” “Oh, I can’t believe you make homemade bread.” “How in the world do you do this?” “I could never make bread. It is so difficult.” I don’t think it took more than about 20 minutes of my actual attention. When I served the pies, which were delicious I might add, I think a couple of people said they were good. Humph. THOSE had taken forever! Keeping these factors in mind, I would like to share my bread recipe/method with you. This is a basic recipe for a 5 qt. Kitchen-Aid. Bosch users can double the recipe. It can also be halved. In fact, you can adjust it just about any way you like. 🙂 It’s a free country. Also, following, I will share my recipe for a 20 qt. Hobart mixer. Through trial and error, I have found that our family likes mostly whole-wheat, but not totally whole wheat. This recipe yields a bread that is about 2/3:1/3. This is kind of a tutorial, though I don’t have very many pictures. Let’s get started. 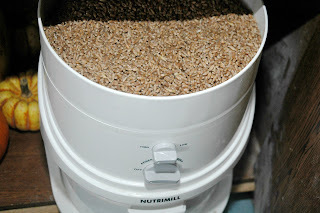 Place the water in the mixer bowl with the yeast. Stir a little to combine. Leave it to sit for a few minutes while you melt the butter. Yes, you can do this in the microwave and I admit that I often do, but it really isn’t good for your food. Just get out a little pot and melt it on the stove. Stir in the salt and sweetener and combine. It doesn’t matter if they dissolve. Grind your wheat if you are doing so. Add the whole wheat flour, gluten flour and butter/salt/sugar mixture to the bowl. Put on the dough hook and turn on the mixer (stir speed at first, then speed 2 when the flour is no longer in danger of flying out) to combine everything. Once it looks pretty uniform, you can either leave it to sit for 15 minutes or so (sometimes I do, mostly I don’t) or you can just start adding in your unbleached flour. With the mixer running on stir speed, I add in the first couple of cups of remaining flour one cup at a time. Allow the dough to assimilate the flour before adding more. After the first two cups, I start adding it 1/4 c. at a time, mixing well after each addition. Knowing when to stop adding flour is a learned skill. You want to watch for the dough to start cleaning the side of the bowl. At first, when there is not enough flour added, you will notice that the dough will start sticking more to the sides. Add some more flour and wait patiently for it to assimilate. Eventually, it will become a nice smooth ball and will clean up the bowl. (If you aren’t sure, err on the side of a little too sticky.) Now, you can turn the mixer up to speed 2 to knead the dough. Knowing when to stop kneading is also a learned skill. With the Kitchen Aid, I find it is somewhere in the neighbourhood of 6 minutes. However, this is a very general guideline. When you think the dough looks nice and smooth and has kneaded for awhile, stop the mixer and pull off a golf-ball sized piece of dough. It should feel a bit like your earlobe. More importantly, though, you can do the ‘window test’. As you can see in the above picture, when stretched, I can see light through my dough without it ripping. This means the gluten has developed enough and the bread is ready to be set aside to rise. 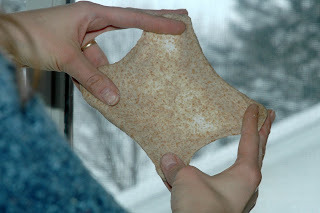 If you try to stretch it and you cannot get a window without it ripping, be patient and knead it some more until you can. Remove the dough from the bowl and put a little splash of oil in the bowl. Form the dough into a ball and turn it around in the oil to coat both the dough and the bowl. Now, cover the dough. It would be much more romantic and healthier to cover the dough with a nice cloth. However, I find that I end up with dough sticking to the cloth, even if I wet it. I hate to post this, but I actually cover it with a plastic bag. (I’m so sorry.) I find it keeps the dough from drying out. Place the bowl in a warm oven. 110 degrees is ideal, but many ovens don’t have a ‘proofing’ setting. I was seriously ticked off when we bought a new stove and I found out it didn’t go below 170 degrees. Apparently, the manufacturers think people are too dumb to cook their food at an appropriate temperature, so they make the oven unable to go below a setting which will sterilize the food. We need the yeast to stay alive to rise the bread, so killing it will not do. What I do is, begrudgingly, put my dough in the oven, set the temperature to 170, turn the timer on for 2 minutes and turn the oven off when it beeps. At no time do I open the door. This seems to work well. Let the dough rise until doubled, about an hour or so. Punch it down to deflate it and squish it up a bit. Now, I suggest using a kitchen scale, but you don’t have to. Measure out 1 1/2 lbs of dough, or just cut it into about 3 equal parts. I like measuring because then they all turn out even. Of course, adjust quantities up or down a little to even things up. Shape into loaves. To do this, I form each piece into a ball and then pinch the bottom in a few times. Making nicely shaped loaves is another learned skill. 🙂 Place in pans and return to oven. Make sure they have lots of space around them to rise. Warm oven as above and leave to rise. Watch until the loaves are risen a bit less than you want them to be in the end. Leave them in the oven and turn the oven on to 350 degrees F.
sound – if you tap the bottom, it should sound hollow. I admit that I don’t completely get this one, but it might be helpful for you. If you aren’t sure, err on the side of a little overbaked, rather than underbaked. Another 5 mintues at 350 degrees won’t hurt. I combine everything but the unbleached flour and then leave to sit for 15 minutes, or just jump into the next step. I follow the basic method outlined above, except that I add in the flour 1 c. at a time. I timed how long I had to knead after adding all the flour and was very surprised that it took 20 minutes on speed 1 before the dough passed the window test. 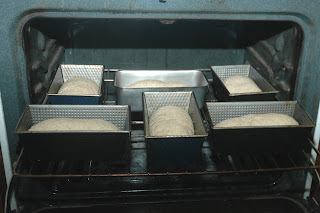 I need to do two bakings, since my oven will only really hold 6 loaves at a time. Organizing more than I bargained for. Today I thought I would tackle cleaning out the cabinet under our kitchen sink. It houses a few cleaning products, the dish rack (so it isn’t on the counter all the time), the crock pot and some junk. It is all just kind of shoved in there with no organization and I didn’t like it one bit. So, I found a sturdy plastic bin to house all the cleaning supplies and I was ready to hunt down the junk and leave the cupboard nice and tidy. I got started and noticed that things seemed to be kind of wet. Awhile ago, I had given baby guy his last sink bath. It was his last because he did an insane amount of jubilant splashing and made a large mess. I thought maybe this was leftover water that I had somehow missed. I pulled out a few more things and was horrified to find that the board at the bottom of the cupboard was completely wet. It was like a wood-sponge. Ewwwwwwww. Now, this board was lining the bottom of our cupboard because the previous owners of our house had some kind of leak, the bottom of the cupboard ended up with a hole and we just stuck a nice sturdy board on top of the hole instead of ripping out the whole bottom of the cupboard. Well, now I had to pull out the good board and survey the damage. At this point, I did what any capable adult woman would do. I called my dad. I had to drive to the store to buy a flashlight because we never seem to have one. This one will stay in the kitchen and I will guard it with my life. With my trusty new flashlight, my dad coached me through the diagnostics and I discovered that it didn’t seem to be coming from an actual pipe or the drain. The problem was around the plate at the base of the faucet. When Steve and I put in a new faucet a few months ago, we didn’t caulk it. Whoops. Combined with the fact that the sprayer had twisted a bit loose and would pour out water along the hose every time the tap was turned on, we had a fair bit of water under the counter. I had to pull everything out from the surrounding cupboards to check for water. Of course, with everything out, it was a good time to wipe down the insides of all the cupboards, a job that – in all honestly- rarely gets done. We tightened up the sprayer, caulked around the faucet and have banned everyone from using the kitchen sink for 24 hours until the caulking is good and cured. I must say…if I had to choose between having a functional kitchen sink and not having a functional kitchen sink, I’d choose to have one. Oh my gosh. I just finished listening to my children sing about 1,000 different versions of “I see London, I see France, I can see your underpants.” Is there no mercy for the hardworking mother? That was so funny I forgot to laugh. My red mixer is broken. I happened awhile ago as I was mixing up a batch of 9 loaves of bread. I heard a clunk that didn’t sound at all good, along with a nasty dragging sound. The hook had stopped turning. Very worried, I took out the dough, which by this time was pretty much done and turned on the mixer briefly. Nope. It was definitely seriously broken. Upon investigation at the repair shop, it was discovered that a gear was broken. It had been repaired before, apparently, but the problem was not at all helped by the fact that it was completely dry. Jim, the wonderful man who gave us the mixer, had told me he had greased it, but we needed to do it again before using it. I didn’t and that is why it broke. It is not a nice feeling to know you have been responsible for breaking an antique Hobart! Our main problem at this point was to try to find a new part. It was not going to be easy as Hobart is not able to identify the model number of my mixer since it is an antique. My dad said he would take on the task of trying to find something. I was thrilled to be baking bread again and our tummies were very happy, too. Sadly, though, my heart was still heavy. I had been given a beautiful, antique mixer by two very kind and generous people, we had it painted up to be a stunning accent in our kitchen (some people thought it looked like a fire hydrant, but what do they know? ), baked up a few large batches of bread and cookies and proceeded to break it. It seemed such a shame to just abandon it for lack of a gear. I prayed for a solution for several days. I hadn’t told many people about the mixer breaking, as it was too sad for me. However, one day I shared the news with a dear friend. After consoling me (and congratulating me on the new one), she asked me what I was going to do with the old one. I had my answer. Her husband believes he knows someone who can make a replacement part. 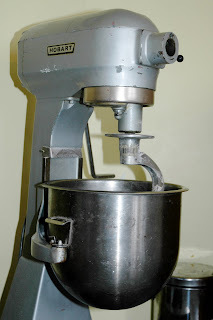 She will give the mixer a new home as she bakes bread for her five children and I can still come and visit it. Thank-you, Lord! 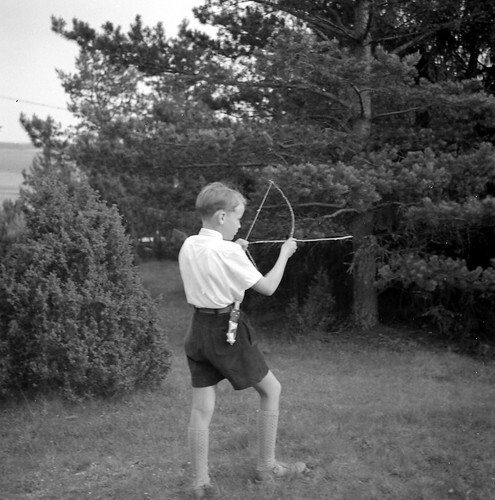 When knitting, there are two ways instructions for the pattern are written, in text or chart format. A chart uses symbols to represent the different stitches to be worked. Text format just tells you outright. Some people’s minds work in such a way that the symbols just make perfect sense to them and are very easy to understand. Other people find it tedious to work with symbols because their mind never seems to ‘click’ to get into the rhythm of understanding them this way and a lot of effort is required to knit from a chart as a result. I am this second type of person. I just need it spelled out for me. 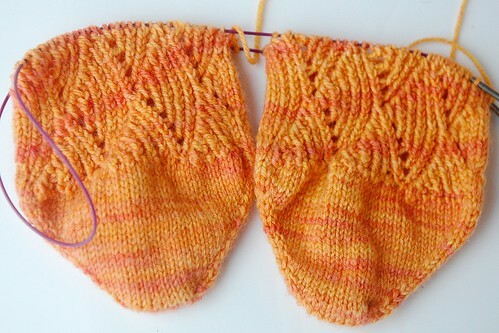 I had been working on some new, lovely socks called Pomatomus Socks. The designer, a knitting genius, has a mind that just seems to ‘see’ the pattern from the symbols on a chart, so her patterns are often written this way. I was enjoying the pattern, but finding it very tedious, so I decided to type up the directions in text. 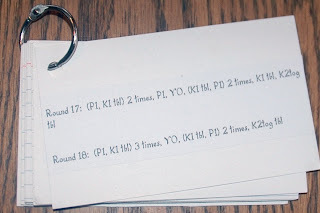 To make them easy to follow, I created a little set of index cards that I could flip over as I completed two rounds. Double and triple check them, making corrections as necessary. In your word document, set up the page in ‘Landscape’, change to ‘two columns’, and add two spaces between each round of instructions. Cut the directions out into strips of two rounds at a time. Glue the strips onto index cards (so that two rounds are on each card). Hole-punch the cards and put them onto a little ring. I believe that I heard this idea from Kelley Petkun on my favourite knitting podcast, KnitPicks. Need a great story for bedtime tonight?